Most drivers in Lewisville can get their vehicle in and out for an oil change in under an hour. For a better idea of weight times at our Lone Star Toyota of Lewisville service center, contact us at (469) 671-0701. You can also schedule a service appointment online to reserve your spot and get back on the streets of Flower Mound quickly. How Long Should an Oil Change Take If I Do It Myself? 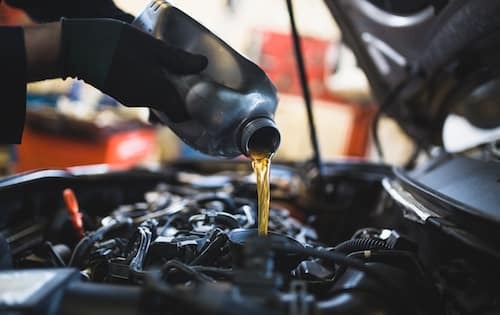 Coppell drivers will find it often takes less time and costs less to turn to a dealership like Lone Star Toyota of Lewisville when it’s time to replace your vehicle’s oil. Our experienced service team is specialized in Toyota vehicles and state-of-the-art equipment allows us to work on more cars than a generic auto shop. Conventional wisdom used to dictate that you should get an oil change every 3,000 miles — but these days, new vehicles need oil changes every 5,000 – 7,500 miles. In fact, some models can even go 10,000 miles between oil changes. Check your owner’s manual or consult one of our certified technicians for a specific oil change interval. Money-saving service specials, including frequent oil change coupons and other offers. Be sure to check and see if your vehicle requires synthetic or conventional oil. Your owner’s manual will have that information. Synthetic oil typically costs more, but it won’t affect that time required for an oil change. To make your service visits even more convenient, Lone Star Toyota of Lewisville offers Toyota Express Maintenance. Simply come in during service hours and we can change your oil on the spot, no appointment needed! Not sure what your dashboard is trying to tell you? We’re here to help you learn what the Toyota dashboard warning lights mean. Visit Lone Star Toyota of Lewisville near Coppell for a Quick Oil Change! We’re located just a short trip from Carrollton, and our qualified service team can handle any maintenance tasks from performing a genuine Toyota oil change to brake repairs. Contact us for more information or stop in for an inspection today.